Teachers can easily create resources and share them with everybody. We made a server transfer to use a secure website. We apologize for any inconvenience it may cause. In case of error in the web browser, please empty the browser history and reload the page. Aplusix Neo comes from the Aplusix Windows software application which is used regularly by middle and high schools. Commands to trigger software automatic calculations. In Training mode, calculation checking on demand. Des commandes pour faire faire certains calculs par l'appareil. At the end of a Test, Aplusix switches to Correction mode and enables checking the calculations and the completion of exercises. Aplusix Neo runs on computers, tablets and smartphones. 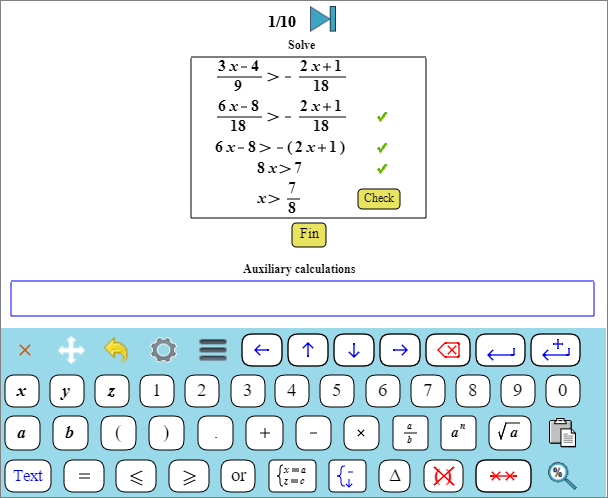 It allows practicing calculations and algebra in a pleasant way everywhere: at the middle school, at the high school, at home, in transports. I like this program because it helped me a lot in Mathematics and it gave me more confidence to do difficult exercises. 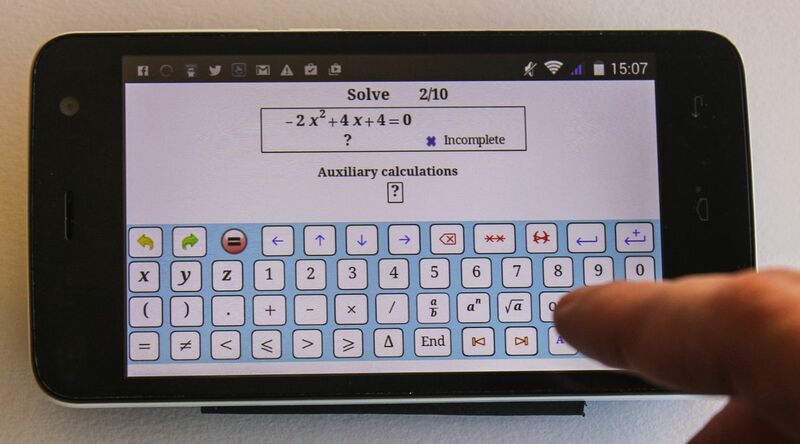 Numerical calculations are done by the device. Some calculations (those that have been chosen by the creator of the resource) can be performed by the device. 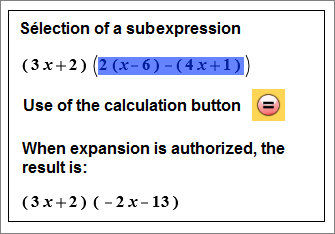 One way to do a calculation is to select a subexpression and use the calculation button that appears in the selection palette, see example opposite. Another way is to do a drag-and-drop calculation by selecting a subexpression and dragging it to another location. The "Presentation" section contains more details on these calculation possibilities. Aplusix Neo groups various and fundamental exercises for algebra and arithmetic. 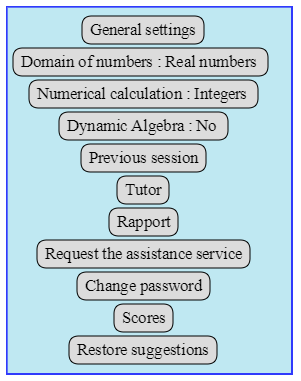 A wide range of exercise is proposed by Aplusix Neo: numerical calculations, factoring, expanding and simplifying, solving equations, inequalities and linear systems of equations. The base of exercises is regularly updated with resources produced by the authors of the application and by middle and high school teachers. 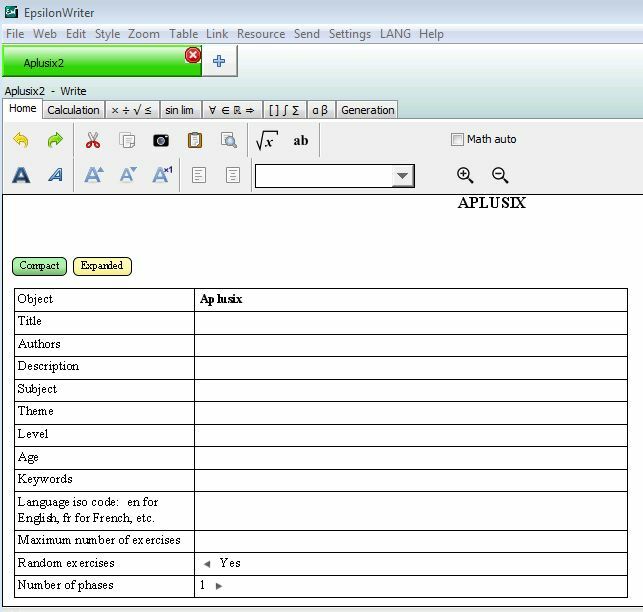 The EpsilonWriter Creator application allows teachers to create exercise files for Aplusix and upload them to the epsilon-publi website. Teachers can also create resources by modifying open source resources of the epsilon-publi site. They can give resources to students through links that are provided by EpsilonWriter Creator; They can be added to the list of teachers who publish resources: List. They can then create a gallery and ask for it to be added to existing galleries. Aplusix Neo can be used in a connected way. Registering is very easy and is done with Aplusix Neo. When you are connected, the calculation steps are recorded online. You can display in the web browser a report of the work done and give its link to whomever you want. You can also register the email address of a tutor(a teacher, a parent,... that agrees such a role) to notify her some work sessions or ask her some help (send email with a direct link to the work done on the given exercise). You can also ask for help to the support service. Scientific experiments, led by math education researchers and psychologists in different countries proved that students who used Aplusix Windows actually improved their skills. It helped me a lot to improve my calculations. My speed has also increased, it is just fantastic! Aplusix Neo was partly funded by the MCSquared european project. This project focus was on social creativity and the design of digital media intended to enhance creativity in mathematical thinking (CMT).